Our most beloved dogs often come into our lives unexpectedly, a chance viewing of a photo on social media or an appeal to care for a dog in need. 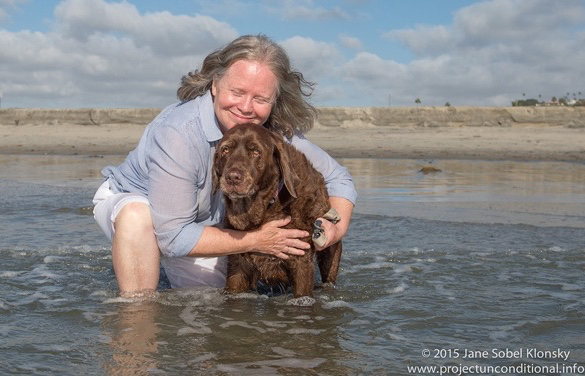 That is what happened to Mary when her daughter, longtime Grey Muzzle volunteer and former board member Chandra Conway, read about a senior Chocolate Brown Labrador Retriever named Walter. Chandra was living in Portland, Oregon, but the plight of the older dog in a Los Angeles shelter had caught her eye, and she found herself trying to find him a safe place to go. Walter was what Mary later described as "a complete hot mess of issues and love.” He had thyroid problems, allergies, and an infection which left him with little fur, but he remained a gentle, well-mannered love-bug. Walter was eventually pulled from the shelter by Labradors and Friends Dog Rescue (a 2012 Grey Muzzle grantee), provided with veterinary care, and boarded, but he still needed a foster family. Chandra volunteered her parents, who lived in the area and were already owners of a Labrador Retriever. They had never fostered a dog before. Walter joined Mary's family as a foster, but once he arrived, they were smitten. He became what is fondly referred to as a "foster failure." Mary tells Walter's story in filmmaker Kacey Klonsky's"Unconditional Stories" video (a companion series to Jane Sobel Klonsky's Project Unconditional). The video was one of the short films featured in this year's Bow Wow Film Festival. In the video, Mary says of Walter, "He's the joy of all of our lives.” You can find out more about Project Unconditional and Unconditional Stories at: www.projectunconditional.info. Unconditional Stories: Walter & Mary from Kacey Klonsky on Vimeo. The Grey Muzzle Organization improves the lives of at-risk senior dogs by providing funding and resources to animal shelters, rescue organizations, sanctuaries, and other nonprofit groups nationwide. For information about all of the wonderful organizations that Grey Muzzle supports, see Who We Help.